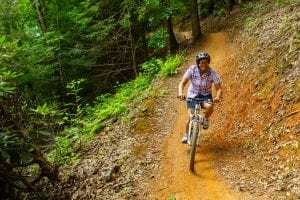 Mountain biking in the Smokies is something that every rider should experience! Whether you’re an expert or have just discovered your love for the sport, this is the perfect place to go. To optimize your Gatlinburg mountain biking experience, here are 5 tips to keep in mind. Our trail here at CLIMB Works is considered intermediate and can be fun for anyone who is comfortable riding a bike. You can bring your own mountain bike if you’d like, but road, hybrid and townie bikes are strongly discouraged. You can also rent a specialized bike from us if you don’t feel like loading and unloading yours. There are also different bike sizes to fit any rider up to 250 lbs. The trail can be as easy or technical as you’d like to make it with the first 1/3 of it uphill, the second 1/3 a smooth flow trail, and the last 1/3 downhill. There are also biking experts here to help you along the way so that you can have the best Gatlinburg mountain biking experience possible! Enjoy a little friendly competition when you take your friends mountain biking with you. This is an especially good idea if you know that your friends are more experienced than you are. Having them there can motivate you to push yourself a little harder, and watching them can help you learn how to be a better rider. If you don’t have friends that enjoy mountain biking, you can always just join a group in your area. Music can take your Gatlinburg mountain biking experience to the next level and help you get in the zone when you’re out riding! From Bluetooth headphones to a phone mounted on your bike, there are so many ways to listen to all your favorite tunes. It’s also a great idea to prepare a playlist so that you don’t feel the need to scroll through songs you don’t want to hear. If you choose to bring your own bike, be sure to check it before you hit the trails to see if anything looks worn out or broken. What may seem like a small problem at home can be a big issue when you’re out riding. There’s nothing worse than getting out on a trail and having your bike break down on you. Keeping your bike maintained can help you avoid a disappointing walk back to the car with a bike in need of repairs and potential injuries. It only takes a few minutes to go over your bike to make sure it’s in good condition, and it’s worth every second! Follow these helpful tips to optimize your Gatlinburg mountain biking experience. If you don’t know where to ride, come visit us here at CLIMB Works during our mountain biking season (which begins March 1). Be sure to read up on what to expect when you visit and get excited for your next adventure!